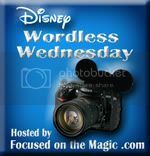 Wordless Wednesday: The Icon of Icons | What's the Point? As a part of the Disney College Program I had to attend "Once Upon a Time is Now," a class about the history of the Magic Kingdom. All new Magic Kingdom Cast Members must participate in the class. We had to arrive at the crack of dawn (literally) for the class. There are some benefits for getting up that early... this shot. We had the opportunity to take photos on Main Street U.S.A. prior to park opening, with only a few managers and security mulling around. It was beautiful and it was a moment I will never forget. With every minute I found myself falling more and more in love with Disney. Ahhh a quiet morning and clean streets, what a great way to start the day! Thanks for sharing. It was perfect! Thanks so much for stopping by! So cool - that class sounds really cool, too.. maybe that's strange! Wow! Beautiful! I am sure that was probably a pretty interesting class! It's amazing how peaceful it can be before all of the hustle and bustle. Thanks for stopping by! Not at ALL Jennifer! It was amazing. I enjoyed every minute of it. Not sure if you've ever done the "Keys to the Kingdom" tour but it was very similar to that. It was very interesting Onna! Very similar to the Keys to the Kingdom tour. Beautiful picture! The experience must have been amazing! The castle truly is the icon of icons! Thanks for sharing your wonderful memories and for linking up to the hop! Gosh, now we know when to get the best shot of the castle.. beautiful pic! I think this is my first time to your blog... nice to "meet" you! Now THIS is worth getting up early for. A seriously enviable shot. Fabulous!! Thanks for hosting Deb! It was a great experience - I will truly never forget it. Nice to "meet" you as well! Thanks for stopping by, I hope you enjoy it. :) Definitely worth it. I'm not a morning person, but I would get up every morning if this was my destination! It looks so peaceful - what a great experience for you!